Apr 26, 2017 (LBO) – Japanese firm Belluna Co. Ltd and Asia Capital PLC celebrated the groundbreaking ceremony of their joint venture on a US 54 million dollar, four-star hotel project in Colombo’s Marine Drive, Tuesday. 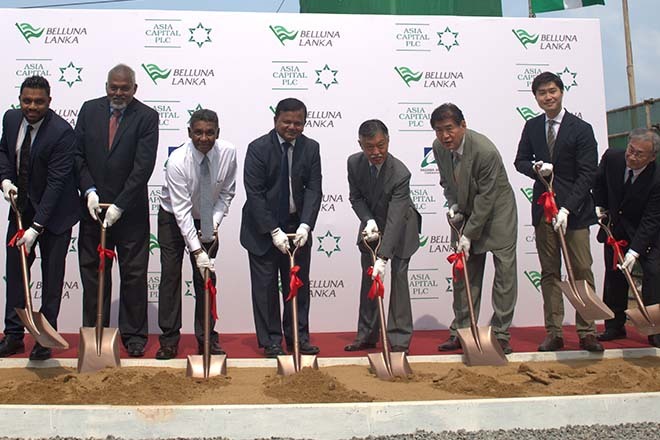 “Belluna Co.’s off-shore expansion focuses strongly on emerging markets and we are pleased to be a part of Sri Lanka’s development drive,’ said Hiroshi Yasuno, managing director of Belluna Co. Ltd. The 300 room, four-star business hotel on Marine Drive will offer guests a choice of deluxe and superior rooms, as well as spacious suites with features such as panoramic views of the Indian Ocean and of Colombo’s city skyline. “The prime location of the hotel is ideal for the new-age business traveller who seeks convenient access to Colombo’s Central Business District, coupled with the contemporary comforts of superior design and amenities,” Stefan Abeyesinhe, group chief executive officer/ director of Asia Capital said. These projects includes a 50 villa ultra-luxurious resort in Galle, for which the foundation stone was laid in October 2016; the ‘447 Luna Tower’ project – a 190 unit exclusive apartment complex being built in the heart of the city at Union Place and a further multi-development project in Colombo which is in the planning stages. Beyond the shores of Sri Lanka, Belluna Co. and Asia Capital are currently in partnership with the leading global hospitality company, Marriot International, Inc. and will open the ‘The Westin Maldives Miriandhoo Resort’, a 70-key luxury property focusing on wellness tourism in the near future. Among those present at the event were chief guest Minister of special assignments, Dr. Sarath Amunugama, the Japanese Ambassador to Sri Lanka, Kenichi Suganuma.